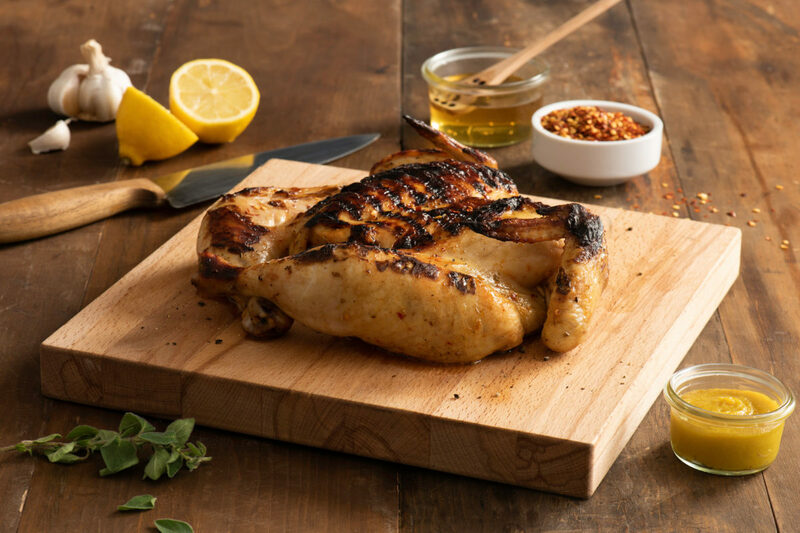 Rubbed with a zesty marinade, this tasty grilled whole chicken is sure to please. Spatchcocking the chicken before grilling reduces the cooking time and makes the bird cook more evenly. Stir together chicken base, lemon zest, lemon juice, honey, oregano, pepper, paprika, garlic and hot pepper flakes; set aside. Using kitchen shears, cut chicken along each side of backbone; remove backbone. Turn chicken breast side up; press firmly on breastbone to flatten. Rub seasoning mix under skin and inside cavity. Let stand for at least 15 minutes or cover and refrigerate for up to 6 hours. Prepare grill for indirect heat. Set foil drip pan on one burner of barbecue under grate and grease grate well; preheat remaining burner to medium heat. Place chicken, breast side down, on greased grate over drip pan. Close lid; grill for about 20 minutes or until charred. Turn over; grill for about 30 minutes or until instant read thermometer inserted in thickest part of thigh reads 165°F. Tent chicken with foil; let stand for 15 minutes before slicing.